Sitting from left: Prof Dr Mohd Ismail Noor (Vice-President of Nutrition Society of Malaysia), Dr Rodolfo F. Florentino (Chairman-President of Nutrition Foundation of the Philippines, Inc.), Prof Dr Le Thi Hop (President of Vietnam Nutrition Association), Dr Tee E Siong (President of Nutrition Society of Malaysia), Prof Dr Hardinsyah Ridwan (President of Food and Nutrition Society of Indonesia), Assoc Prof Dr Umaporn Suthutvoravut (President of Nutrition Association of Thailand). 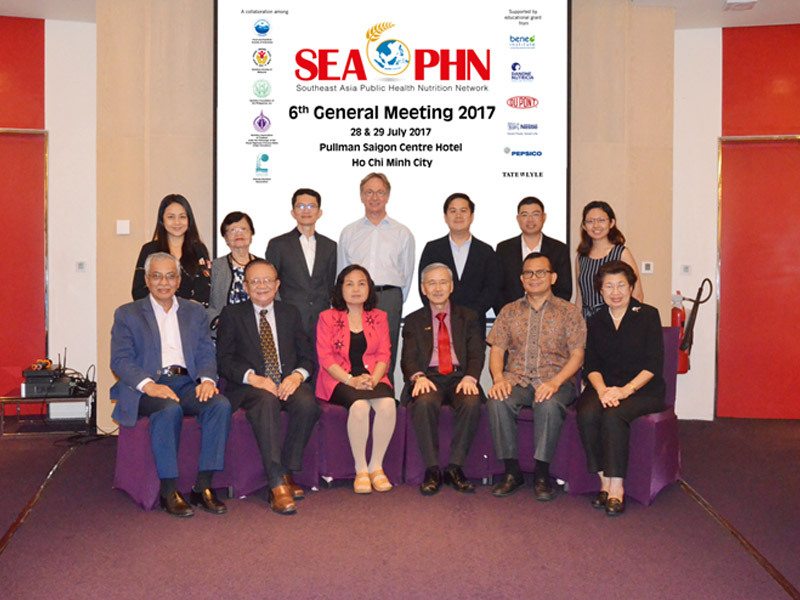 The meeting reviewed the previous Minutes from the 5th General Meeting held on May 18, 2017 in Kuala Lumpur, Malaysia. The meeting discussed on the detailed proposal (methodology & implementation plan), topics to be included in the final module and the proposed key messages. The meeting discussed on the next step for the compilation of NPAN of SEA Countries.